The Lake Country Coating Applicator applies perfectly even and extremely uniform coats of your favorite paint or surface coating. A dual-sided design ensures that you get the most coverage per drop of your coating, while providing an easy-to-hold handle for maximum comfort. The ingenious rectangular-block design of the Lake Country Coating Applicator allows you to apply coatings quickly over large areas, while giving you the ability to coat the most complex body panels with ease. 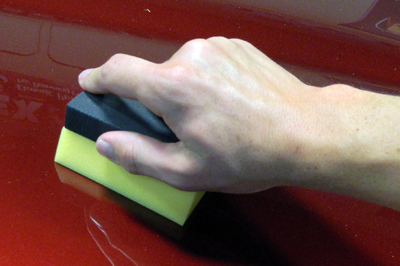 The Lake Country Coating Applicator uses a specially-engineered, gold foam, applicator surface. This extremely-soft foam has a high pores per inch (PPI) count, which keeps your coating from absorbing into the applicator. Rather, your coating remains on the surface so you get the most coverage possible. Additionally, the Lake Country Coating Applicator's gold foam application surface conforms to the most curvaceous body panels without wrinkling, so you get a perfectly uniform coating no matter the design. The small, easy-to-hold, Lake Country Coating Applicator is perfectly suited to applying wheel coatings to the most intricate wheel designs. The soft foam conforms to any spoke design, while the distinct edges allow you to work your coating against wheel lips and seams. The gold foam is attached to a neoprene block for easy holding, no matter how its held. Simply put, the Lake Country Coating Applicator makes applying glass, wheel, paint and surface coatings easier, regardless of design challenges. High spots! Anybody who applies coatings knows that these are dreaded words. High spots are uneven patches of coating material that dry and form permanent streaks. The Lake Country Coating Applicator works with your coating to help eliminate high spots from occurring. The soft, flexible foam spreads your favorite coatings in an even manner, reducing the amount of follow-up towel buffing. While originally designed to apply the latest generation of coatings, the Lake Country Coating Applicator is perfect for applying your favorite liquid wax or synthetic paint sealant. If you appreciate easy application, you will love using this applicator. The Lake Country Coating Applicator is washable and reusable. Clean immediately after use with BLACKFIRE Advanced Pad Cleaner and allow to dry completely. 2 pack.